The 187-page report drew from hundreds of studies and reports on the possible impact of the amendment on Ohio's economy, public safety and public health. Legalization opponents were quick to criticize the legitimacy of the report, which was completed in about one month. Hamilton County Prosecutor Joe Deters, who chaired the Marijuana Policies of Ohio Taskforce, said the report does not take a position on ResponsibleOhio's amendment to legalize marijuana for recreational and personal use, limiting commercial growing to 10 sites. 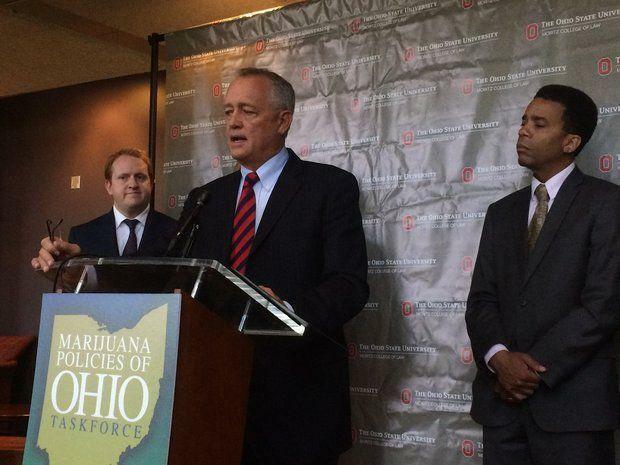 "Legalization is coming to Ohio," Deters said. "We need to accept the reality this is going to happen." Deters works with attorney Christopher Stock, a consultant to the ResponsibleOhio campaign who helped write the amendment and facilitate at least $36 million in securities offerings by campaign investors. Deters said he and most task force members were not paid to complete the report, but ResponsibleOhio compensated some experts and members who wrote the report. The task force examined ResponsibleOhio's amendment by applying data from the 23 states that have medical marijuana programs and four states that have legalized recreational marijuana. "We have laboratories across the country," Deters told reporters Thursday. "We need to take an honest look at how this thing operates and what model we're going to have in Ohio." The report makes no conclusions but tends to use facts to support ResponsibleOhio's plan. For example, the report cites American Civil Liberties data showing African Americans were arrested for marijuana possession more than their white neighbors. But according to the FBI's Uniform Crime Report, 37 percent of adults arrested for marijuana possession in 2013 were black while 62 percent were white. Marcie Siedel, executive director of Drug-Free Action Alliance, said the report relies on reports from pro-marijuana organizations and ignores data and research showing the harmful effects of marijuana and legalization. "[The task force] lacked transparency through the process, community and expert input and reads like a document filled with campaign propaganda that this monopoly hopes will dupe Ohio's citizens into voting for the worst public policy to ever come before the Ohio voters," Siedel said in an email. ResponsibleOhio plans to tax marijuana at 15 percent at the wholesale and manufacturing levels and 5 percent at retail stores, with revenues going toward public services, cannabis research and drug addiction and abuse treatment. The report concluded the ResponsibleOhio model would create 16,395 jobs in the marijuana industry and more than 18,000 indirect jobs using the IMPLAN economic model on ResponsibleOhio's projected sales of $2.6 billion annually. Michael Thomas, task force member and former chair of the Cuyahoga County Community Mental Health Board, said the report recognizes negative health aspects of marijuana use. Thomas said heavy marijuana users can become dependent on the drug and suffer withdrawal symptoms, although not as severe as alcohol and other drugs. He said research shows across the board that marijuana use by youth is detrimental in the long run, and prevention and education for youth must continue. The belief by teens "that marijuana is risky is going down and we don't want to take that too far," Thomas said. "We need to cut out some of the hyperbole on both sides and that's what the task force was designed to do." Ohio Auditor Dave Yost said the report makes several mistakes, noting the economic analysis does not account for costs such as workers not coming to work and double counts some money already being spent. Yost, a Republican and former Delaware County prosecutor, said he was "stunned" Deters would issue such a report. "I don't think Joe would put this report into evidence in a court of law," Yost said. "It wouldn't stand up under cross examination." Deters personally thinks marijuana should be legal, splitting from fellow Republican officials who denounced the plan earlier this year. Deters said it was offensive that state lawmakers are considering circumventing ResponsibleOhio's constitutional amendment expected to appear on the November ballot. "Ohioans, like juries, are a lot smarter than people think and for politicians to posture themselves to remove them from the choice of voters is dead wrong," Deters said. RepsonsibleOhio must collect more than 305,591 signatures of registered Ohio voters by July 1 to qualify for the November ballot. The group announced this week it had collected more than 550,000. Several other groups are working on amendments for the 2016 ballot. Mobile readers, click here to read the report.